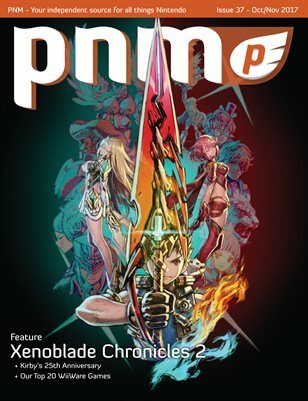 Xenoblade Chronicles 2 is our cover story this issue and we do a deep dive into the game’s characters, world, and gameplay. We are also celebrating the 25th anniversary of the dynamic pink puff himself, Kirby! Be sure to check out our Top 20 WiiWare games as well and pick up some games before the Wii Shop Channel goes offline. If you haven’t picked up Chicken Wiggle yet, you need to—we have a big spread on our favorite levels with comments from Jools Watsham himself. Katelyn continues our Culture Connections series by highlighting the Nurikabe. There is a lot of other great content in this issue including a new Retro Review, Lost Levels, Cartoon Corner and more! The whole staff has been extra busy lately reviewing all the new Nintendo Switch games—there have been a ton of great ones lately! Happy Gaming!